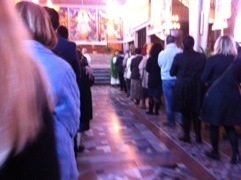 Today is Sunday so we went to one of the 800+ churches in Rome. it was the Gregorio VII Catholic Church. 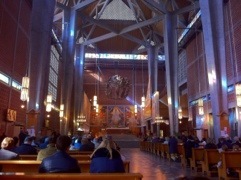 It was full at 11:30 AM but there were five other Masses today. Imagine that there are an similar number of Masses at the other churches. That is 800 churches x 6 Masses = 4,800 Masses on a given Sunday. Even if some churches have fewer Mass times, it is still an impressive number. Plus, the people are devout. 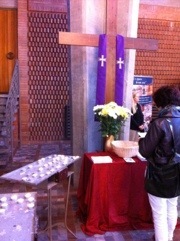 Many arrive early to pray the Rosary before Mass. The Gregorio VII has a number of side prayer chapels that were all full before and after Mass. It was not all older people in the church either. About half were young, and in their 20’s – 40’s. It was encouraging. I defy anyone to find this kind of devout love for God and worship of Jesus Christ in the “Reformation” countries in northern Europe where most have lost their faith. Italy may have it’s own set of problems, but permeating society there is still a widespread devout faith, one that I am proud to join and encourage. The homily was in Italian, so I didn’t understand it. But this Franciscan priest was passionate, enthusiastic and from what I observed he was a strong preacher with a love of God and a desire to light the people on fire for the truth.